Put a soup pot on the stove and parboil the mushrooms in the butter. Add the poblano peppers, frozen corn, pearl onions, chicken broth, chicken bouillon and salt and pepper (optional). Thoroughly stir and let cook, covered, over medium heat for 30-40 minutes, until the onion is soft. Serve immediately. You may use white mushrooms in place of the Portobello mushrooms. To face the cold weather, there's nothing like a bowl or cup of soup to warm your hands, and the soul. Casseroles and stews made with mushrooms and onions are comforting and hearty for the winter months, and soups and broths play an important role in the Latin kitchen. 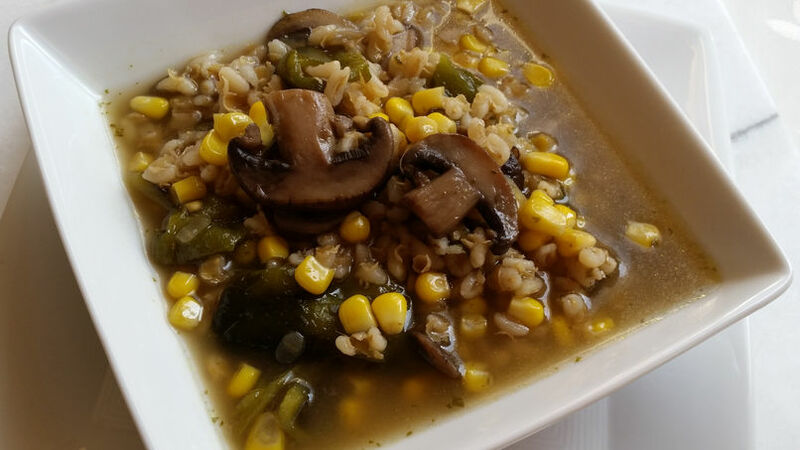 Inspired by mushroom broth, a Mexican tradition, I have prepared a mushroom soup with pearl onion, tender kernels of corn and slices of poblano chili pepper that I’m sure you will enjoy.